Published: June 19, 2015 8:15 am Updated: June 19, 2015 8:23 a.m.
ESKI MOSUL, Iraq — Inside the Islamic State's realm, the paper testifying that you have "repented" from your heretical past must be carried at all times. Many people laminate it just to be safe. It can mean the difference between life and death. Bilal Abdullah learned that not long after the extremists took over his Iraqi village, Eski Mosul, a year ago. As he walked down the street, an Islamic State fighter in a pickup truck asked directions to a local mosque. When Abdullah didn't recognize the mosque's name, the fighter became suspicious. "He told me my faith is weak and asked, 'Do you pray?'" Abdullah recalled. Then the fighter asked to see his "repentance card." Abdullah had been a policeman until the IS takeover, and policemen and soldiers are required to have one. So are many other former government loyalists or employees — even former English teachers, since they once taught a "forbidden" language and tailors of women's clothes because they once designed styles deemed un-Islamic. Abdullah had left his card at home. Terrified, he sent his son running to get it. "They are brutal people," he told The Associated Press. "They can consider you an infidel for the simplest thing." The Islamic State's "caliphate," declared a year ago, stretches across northern Syria through much of northern and western Iraq. Untold numbers have been killed because they were deemed dangerous to the IS, or insufficiently pious; 5-8 million endure a regime that has swiftly turned their world upside down, extending its control into every corner of life to enforce its own radical interpretation of Islamic law, or Shariah. 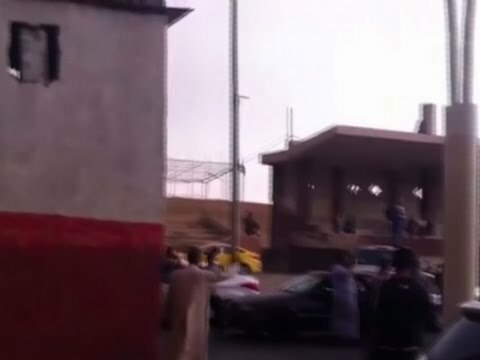 The Islamic State's domain is a place where men douse themselves with cologne to hide the odor of forbidden cigarettes; where taxi drivers or motorists usually play the IS radio station, since music can get a driver 10 lashes; where women must be entirely covered, in black, and in flat-soled shoes; where people are thrown to their deaths off buildings on suspicion of homosexuality; where shops must close during Muslim prayers, and everyone found outdoors must attend. There is no safe way out. People vanish— their disappearance explained by a video of their beheading, an uninformative death certificate, or nothing at all. "People hate them, but they've despaired, and they don't see anyone supporting them if they rise up," said a 28-year-old Syrian who asked to be identified only by the nickname he uses in political activism, Adnan, in order to protect his family still living under IS rule. "People feel that nobody is with them." The AP interviewed more than 20 Iraqis and Syrians who survived life under the group's rule. One AP team travelled to several towns in northern Iraq, including Eski Mosul, north of Mosul, where residents are just emerging from nearly seven months under IS rule. Another AP team travelled to Turkish cities along the border, where Syrians who have fled IS territory have taken refuge. What follows is based on their accounts, many of which were verified by multiple people, as well as on IS social media and broadcast operations and documents obtained by the AP, including copies of repentance cards, weapons inventories, leaflets detailing rules of women's dress and permission forms to travel outside IS territory — all emblazoned with the IS black banner and logo, "Caliphate in the path of the prophet." The picture they paint suggests the Islamic State's territory, now an area roughly the size of Switzerland, has evolved into an entrenched pseudo-state, one based on a bureaucracy of terror. In January 2014, when the Islamic State group took over the Syrian city of Raqqa, Adnan fled, fearing his work as a political activist would make him a target. But after a few months of missing his family, he returned to see whether he could endure life under the extremists. Adnan found Raqqa transformed from a once-colorful cosmopolitan city into the Islamic State's de facto capital. Women covered head to toe in black scurried quickly to markets before rushing home, young men avoided the cafes they once frequented. IS fighters turned the city soccer stadium into a prison and interrogation center, known as "Point 11." One of the city's central plazas was now referred to by residents as "Jaheem" Square — Hell Square. He soon learned why. He heard celebratory gunshots one day and saw the bodies of three men dangling from poles in Hell Square. The corpses were left there for three days, he told AP as he chain-smoked in a cafe in Gaziantep, a town on the Turkish border filled with Syrians living in exile. The reign of terror he had fled had gotten only worse, he said. Each time the Islamic State group overruns a community, the pattern has been roughly similar, AP found — as methodical as it is bloody. First comes an initial wave of killings of police and troops. Then the fighters often seek to garner support by quickly repairing electricity and water lines. They call on bureaucrats to return to work. Government employees and any former troops or policemen sign their "repentance" papers and must hand over their weapons or pay fines sometimes amounting to several thousand dollars. In loudspeaker announcements, mosque sermons and leaflets, new regulations are laid out: No smoking, no alcohol, and no women working except as nurses or in women's clothing shops, where even mannequins in store windows are covered. Residents said they were required to build walls outside their homes so women would never be seen. In each district, an "emir" — often a local militant — is appointed to govern. Schools close, then reopen with IS-written curricula. Taxes are imposed on businesses. Pharmacies are given Shariah courses and banned from selling contraceptives. In most locations, tribes or families declare loyalty to the group and gain positions or perks, several interviewees told AP. Adnan stayed in Raqqa for almost a year, watching the extremists pervade nearly every aspect of life. IS authorities came to his family's car parts store and demanded taxes — the equivalent of $5,000. The group was clearly flush with money from taxing businesses, confiscating lands from those who fled and sales from oil fields captured further east in Syria, Adnan said. Then Adnan's one-time activism in support of Syrian rebels caught up with him. In January, a patrol raided his family home, confiscated his laptop and arrested him for publishing online articles they said encouraged secularism. "Such a pretty house," a patrol member said before smashing two glass water pipes. "This pollutes the environment," he told Adnan. For the next 55 days, Adnan was held in Point 11, the soccer stadium. He was interrogated three times in the initial days, beaten with a green plastic pipe. Then he was moved out of isolation into wards with other prisoners. Soon after came another gruesome moment. One of the top Islamic State judges in the area, a local man known by the pseudonym Abu Ali al-Sharei, dropped by in early February to teach another lesson in Islamic law to the prisoners. He made small talk with a roomful of them. Then he grinned and said, "Listen, I haven't told you yet, but today we made al-Kaseasbeh crispy." He took a flash drive out of his pocket, Adnan said, and, to the prisoners' horror, played them footage of captured Jordanian Air Force pilot Muath al-Kaseasbeh being burned alive in a cage by his IS captors. Adnan's account is just one example of how IS uses the execution videos that it broadcasts to the world online to also intimidate people under its rule. In Raqqa's prison, Adnan's job of distributing food to other inmates gave him a broad view of operations. He saw two Kurdish prisoners and overheard wardens saying the pair would likely be used in Kurdish-language propaganda videos before being released. Adnan said he also saw several foreign Islamic State fighters being held — three Turks, an Uzbek, a Russian and a Yemeni — apparently on suspicion of spying. Two other IS fighters were brought in for stealing booty looted from the Syrian Kurdish town of Kobani rather than sharing it with other fighters. Kobani was the scene of the biggest defeat of IS in Syria, when Kurdish forces backed by U.S. airstrikes drove off the militants after months of heavy fighting. "We gave up 2,200 martyrs in Kobani, and you go and steal?" Adnan said he heard the interrogator shouting at the two detained militants. Adnan met Palestinian prisoner Mohammed Musallam, whom IS accused of being a spy for Israel. Musallam told Adnan his captors were repeatedly filming him in his own execution video. Each time, he said, they would video a child shooting him in the head — but each time the gun would be empty. "Then one day, they executed him for real," Adnan said. In March, the Islamic State group released a video showing Musallam's death. Kneeling in a field, he is shot in the head by a young boy wearing military camouflage. Adnan said he believes that is why many victims in the execution videos appear so calm. "They repeat the thing with them like 20 times. So when the real one comes, the prisoner will think it's just another mock execution," he said. In Eski Mosul, a village on a bend in Iraq's Tigris River, Sheikh Abdullah Ibrahim lives in one of the larger houses, behind high walls with a garden. He looked exhausted as he showed AP journalists one IS vestige he's keeping: the death certificate for his wife, the group's black logo on top. It's all he has left of her. IS swept into the village of some 3,000 families in June last year, established its reign over a grim seven-month period, then fled in January when Kurdish fighters ran them out. IS forces remain dug in only a few miles away, so close that smoke can be seen from fighting on the front lines. Ibrahim's wife, Buthaina, had been an outspoken human rights advocate and had run for the provincial council in Mosul. So when IS took over, fighters demanded she apply for a repentance card. "She said she'd never stoop so low," her husband said. He knew the danger. He had seen the bodies of a dozen policemen in the street, shot in the head. He'd seen others thrown off buildings. He had heard talk of the dreaded "Khasfa," a deep natural sinkhole in the desert south of Mosul where the extremists boast of throwing bodies — or sometimes living victims. Ibrahim sent his wife away to safety for a few days, but she soon returned, missing their three daughters and two sons, he said. Her youngest was 2. A few nights later, in early October, the militants came for her, he said. Ibrahim and his wife were asleep, but their daughters were watching TV. "Wake up, dad, Daesh is in the front yard," they called out, using the group's Arabic acronym. Ibrahim saw the house was surrounded. They demanded to see Buthaina. Ibrahim tried to protect her, he said, but she came out and confronted the IS extremists, demanding an explanation. An argument ensued, and one militant handcuffed the sheikh and knocked him across the head with a pistol. The men pushed Buthaina into their car, and took Ibrahim's as well. A member of the powerful al-Jabour tribe, Ibrahim hoped his connections — and money — could win Buthaina's freedom. He and fellow tribesmen went to the nearby town of Tal Afar, an IS stronghold from which many of the fighters who took Eski Mosul had come. There, he said, he met in a mosque with Abu Alaa al-Afari, a local IS commander who some Iraqi officials now believe has risen to become the No. 2 figure in the "caliphate." Ibrahim begged for his wife's release, pointing out that she was still breastfeeding their youngest son, Arkam. "It doesn't matter. Your children will become orphans," al-Afari replied, according to Ibrahim. Another Eski Mosul resident, 31-year-old Fadi Mohammed, wishes that all he had gotten from IS was his brother's death certificate. He and his brother, Mohammed Mohammed, were both former policemen who had given up their weapons and signed repentance papers. But his brother was arrested after informants claimed he was part of an elite intelligence unit. Mohammed Mohammed was sent to Mosul. In January, 13 days before the Kurds took back Eski Mosul, Mohammed said IS militants "brought us discs that showed his beheading." Now, he said, "I want to blow myself up among Daesh. Even that won't satisfy me. If I chop them up, drink their blood and eat their hearts, it won't take away my pain." Laying low was often key to survival in the "caliphate," several of those interviewed said. Best to stay home as much as possible, avoiding checkpoints of IS fighters and the "Hisba" committees, the dreaded enforcers of IS' innumerable regulations. Armed members of the Hisba patrol the streets, cruising in SUVs with blackened windows and wearing Afghan-style baggy pants, long shirts and face masks, looking for behavior deemed unacceptable. Punishments for smoking, for wearing Western clothes or for playing the wrong radio station can vary from a fine to imprisonment for a few hours or days — often depending on the Hisba's mood. For more serious or repeat offenses, the fighters might bind the perpetrator to a pole in a town square for several days with his crime written on a sign around his neck. Women try not to go out at all, most of those interviewed by AP said. If they do go to market, they sometimes avoid taking their husbands, sons or brothers with them: If they're harassed by the Hisba, their male relative might defend them and bring the Hisba's wrath. It's not an unreasonable fear. Abu Zein, a 31-year-old who recently fled the eastern Syrian town of Muhassan, recounted how a Hisba member one day berated a woman for being improperly covered as she swept her porch. Her brother came out and argued, the fight escalated, the militant shot the brother, and the brother's relatives promptly killed the militant. Soon after, a larger contingent of Islamic State fighters descended on the house and killed eight members of the family, Abu Zein said. Abu Zein said he was detained multiple times for various minor offenses, including visiting his uncle's grave. During Islamic holidays late last year, he said, militants announced in mosques that it was forbidden to visit the graves of relatives, a holiday tradition that IS sees as encouraging polytheism. Abu Zein's uncle had died of cancer the year before, so he, his cousin and another relative decided to defy the ban. As they approached the graveyard, IS fighters opened fire over their heads, shouting "Grave worshippers!" and "This is forbidden!" Abu Zein said he and his friends tried to reason with them. "You cannot stop me from visiting my father," cried Abu Zein's 20-year-old cousin — prompting one militant to slap him across the face. The three were arrested and detained for several hours before being released with a warning. Sheikh Abdullah Ibrahim's wife, Buthaina, never reappeared after being taken by the militants. Shortly after her husband appealed for her release, he received the death certificate. A simple sheet of paper from an "Islamic court" with a judge's signature, it said only that Buthaina's death was verified, nothing more. It is a horrifying document, but he's keeping it, he said, "because it has her name on it." Escape is not easy. Residents are banned from leaving their cities without first applying for permission, filling out a long form with all their personal details and setting property as a guarantee that IS will seize if they don't return. Women must apply to the Hisba to travel and are often refused permission, out of concern that they will not follow IS dress codes once they are out. When Adnan's aunt needed cancer treatment, she applied to leave IS territory to get care. The IS refused but sent her to Mosul, paying for transport and some of the medical costs, though not her chemotherapy. In March, after Adnan had spent 55 days in prison, a top IS leader in Raqqa freed about 40 inmates — including the young Syrian activist. Adnan decided it was time for him to go. He paid a smuggler to drive him along dirt roads about 25 kilometers to the Tal Abyad border crossing, which at the time was in IS hands and was shut from the Turkish side, then paid another smuggler to get him into Turkey. "It was an adventure," he said, smiling. Escape was much more harrowing for Ali, a 63-year-old appliance store owner from the Iraqi town of al-Zaab, near Mosul, who asked that his full name not be used to protect relatives still under IS rule. He told AP that when he decided to flee, he managed to convince local authorities he was only going on a three-day work trip. They gave him a permission slip without a guarantee of property, so he set out in his car with his wife, son and daughter-in-law. Between them and freedom were three different checkpoints. At the first, fighters wrote down the model and license number of his car. At the second, they searched his car, then ordered him to return to the first checkpoint. There, the fighters told him his car registration was improper and he had no property guarantee. "Your fate will be execution," he said they told him. But in a show of how capricious life can be under the Islamic State, a commander at the checkpoint made a phone call and got approval to let Ali and his family pass. "God give him long life," Ali said of the commander. He said he'd rather have been killed right there at the checkpoint than be forced to drive back into IS-held al-Zaab. In Eski Mosul, delivery from IS came to residents at the hands of Kurdish fighters. Amid the joy over liberation — and perhaps worry over being accused of having IS loyalties — many residents promptly discarded documents from the Islamic State. Not Salim Ahmed. For nearly seven months, the 23-year-old former soldier had clung to his repentance card, always having it ready at checkpoints. He hated the card. He had refused to laminate it, unwilling to give it a sense of permanence. Now IS is gone, but the fear instilled in him is not. He still carries his card. "We live very close to their front line," he said. "One day, they might come back and ask me for my repentance card again." Salama and Janssen reported from Eski Mosul, Karam from Gaziantep, Turkey, and Keath from Cairo. AP journalists Mohammed Rasool and Hussein Malla in Beirut and Salar Salim in Irbil, Iraq, contributed to this report.